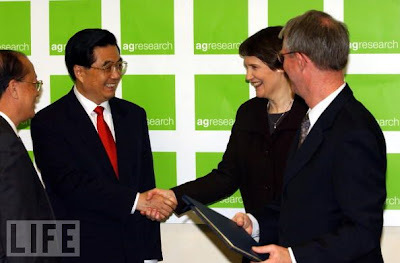 Allegations of "China cuddling" will come as no surprise to serious students of New Zealand's 1999/2008 socialist Labour Government. October 26, 2003, Helen Clark shakes hands with Chinese President Hu Jintao after signing two market access protocols between NZ and China at the Ruakura Research Centre. Helen Clark, meets with Chinese President, Hu Jintao, at the Great Hall of the People in Beijing, May 30, 2005. A former New Zealand government courted China and France in an attempt to curb American and Australian influence in the Pacific, according to a leaked diplomatic cable published here Saturday. New Zealand is also said to have formulated its anti-nuclear legislation, which caused a deep rift with Washington, because of a desire to trim its defence budget as well as for publicly stated ideological reasons. During a visit by the Chinese vice-minister for trade, "New Zealand Trade Minister (Jim) Sutton publicly claimed that China was New Zealand's most important and valued trading partner, a claim that left Australian officials here scratching their heads in wonder." Clark currently holds the position of Administrator of the United Nations Development Programme - the third highest position in the U.N. She is also the chair of the United Nations Development Group. While patriotic Kiwis are overjoyed that Clark no longer infects our body politic, her current position enables her to inflict damage on an international scale. 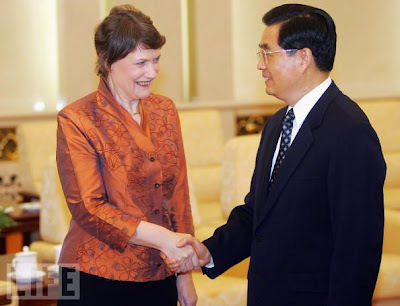 Surely nothing crystallises Helen Clark's true nature such as the utmost contradiction in her position, to this day, as a champion of "reproductive rights", i.e. abortion; - and her subsequent actions, once in power, of courting one of the grossest state oppressors of women's "reproductive rights" in the entire world: China. A country that we know - and she must surely know - punishes women who have too many children with forced abortion, forced sterilisation, and/or fines. Does Clark care about the truth? No. Leftists only care about what they have the power to control and to gain more power from.